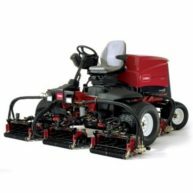 The Reelmaster® 5610 is designed to deliver the performance you’ve come to expect from Toro. Built to handle the heavy work load pass after pass and year after year, the 44.2 hp (33 kW) turbo engine provides the muscle to get the job done with power to spare. The 5610 comes standard with the larger 7` (17.8 cm) diameter 8 or 11 blade cutting units. Available in standard 2 wheel drive or add on the CrossTrax® all-wheel drive system.